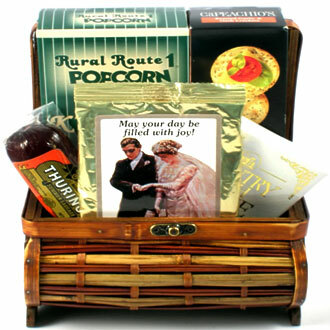 Make their wedding day even more special by sending your heartfelt sentiments to the happy newly weds along with this special keepsake wedding gift chest. Help to make their wedding day even more special by sending your heartfelt sentiments along with this very special wedding gift. This beautiful handcrafted gift trunk arrives filled with Toasted Butter Crackers, Smoked Summer Sausage, Swiss Cheese, Popcorn mixed with Almonds and creamy White Fudge, decadent Chocolate Fudge and gourmet Coffee in a ìMay Your Day Be Filled With Joyî themed pouch!